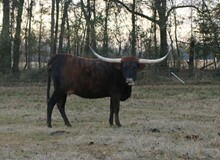 Big Big Big bodied heifer with flat flat flat horn growth out of a high horned female. Photo was taken at a year old. She sold as a weanling.